I am considering traveling to Austin this year for MotoGP and I'm looking for advice on two things- the track and things to do in Austin. TRACK- Best track location to watch the race? Is the paddock pass worth it? Any other advice to make the track experience more enjoyable. AUSTIN- Best restaurants/bars? I'll be looking for some good BBQ. Other points of interest? I think me and a buddy might be going this year. I will let you know if we end up grabbing tickets. Tickets are on presale right now. Did you get the email? I saw that, that's what got me thinking. It was a fun time last year with several of us from here going. Does Austin have a Cannery Row type Saturday night like Monterey used to have? They have all of whats called "6th Street". A strip of bars and restaurants. Its in Downtown Austin and was where most everyone parties. We rented a house for Formula 1 but will probably stay downtown for MotoGP. I saw Stevie Ray Vaughn in 6th street one year. That place is fun! Turn 1 is good. Its the high point of the track. You can see most of the track from that viewpoint. Also, Turn 19, 15, and 12 are very good spots as well. A lot of crashes in turn 19 for some reason (maybe its the parts unlimited tent?). IMO the paddock pass is not worth it. They have a paddock walk, which is mainly a roped off section maybe 30 feet from the garages. Thats pretty cool, but nothing to special. General Admission over Grand Stand Seating. Its a great track for General Admission. If you can, gather on top of the mullet about an hour before the race. You can see the entire track and well worth the 20 buck vantage point. Last edited by kawasakirob; Sun Dec 7th, 2014 at 05:52 PM. BBQ: Terry Black's on Barton Springs is very good. Other points of interest: Gourdough's Doughnuts. I had the Mama's Cake, a doughnut filled with cake batter and covered with chocolate fudge icing. My arteries may never recover. Tell me more! We were going to get the Paddock Pass just because it allows seating at multiple corners includes the walk, breakfast, lunch and booze. You might be lucky to catch a glimpse of the rider running from their trailer to garage. Maybe a quick flash of the bike but nothing worth the price. Since COTA is so fan friendly, general admission on the hillside gives you as good a view as from the bleacher seats. BTW track food at COTA is really good. The BBQ food truck portions are enormous. Fair selection of tamales as well as Aussie Pie and other stuff besides the usual burgers and fries. Best seat in the house is corner working. Free paddock and hot-pit entry when the track is not hot. The paddock is limited to small sections of space behind the garages which are all gated off. It is more of a viewing the paddock pass than a typical walk around the paddock pass. World Superbike paddock passes at Miller and now Laguna give you much more opportunity to get much more up close and personal to the bikes and riders. Wolfeyez you must have gotten lucky with your gig because my stints to the paddock were limited when I was working the corners. The best thing was getting sprayed by the champagne in winners circle. Man Pedrosa is short!!! I think I am going this year, going to buy the pre-sale GA tickets for my friend, his kid and myself. Salt Lick was a bit of a drive but they have all you can eat! I was there 2012 for F1 and we ran Ben Spies in a bar downtown. YES! It was a blast last year and a great way to watch the race. We even got to recover a Moto2 bike and stand on the edge of the track as racers did their cool down laps. I made the mistake of not having a vehicle. Austin public transportation is great, but I missed out on things in the process of getting to and from the track on the corner worker bus. Corner workers can camp at the track for free, so I might ride down next year and camp. If you plan on going to both F1 and MotoGP COTA is doing a bundle right now for F1, MotoGP, LeMans, US Vintage championship and the Pirelli championship for 222 bucks. Super low. Also you gotta go up in the Mullet. Well worth the 20 bucks for qualifying and/or race. That deal says it expired last week unfortunately. Thanks for your support and attending the 2014 MotoGP race. I’m reaching out because I want to make sure that you are one aware that 2015 MotoGP tickets are on sale and that I would like to help you in your buying process in anyway. The pricing is the exact same as last year with some small improvements. The Paddock Pass to behind the garages is available again this year for $200. We have also upgraded our VIP Paddock ticket as well as it will be a much more desirable experience. I assumed the paddock pass, besides giving you views of the garages, is an area for entertaining spectators when they are not watching the races. Possibly with booths and interactive activities set up. No? Is parking Lot F or Lot T more convenient to access the track? Last edited by Cars-R-Coffins; Tue Dec 9th, 2014 at 06:38 PM. F-lot is pretty easy to access the track. We parked a car there and walked to the main gate, no biggie. If you have a Ducati you can park in Ducati Island inside the venue. We couldn't find anything official listed on anything. I missed that aspect in Austin. Monterey was awesome! I was confused. I think me and my buddy are going to splurge on this trip. I misunderstood "paddock pass" and thought everyone was talking about the "premium paddock pass". 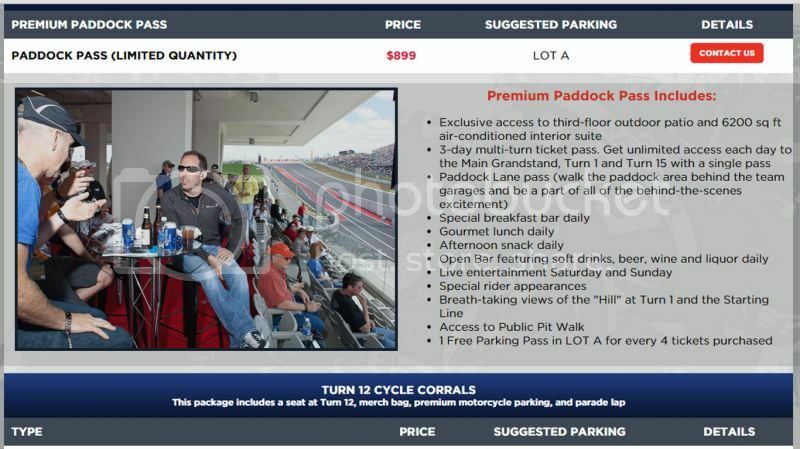 I agree for $200 I wouldnt (at COTA) get he paddock pass. This is the "premium" pass we are going to do. There are a handful more perks that come along with it to.